Chocolate and peanut butter, peanut butter and chocolate – it’s one of the world’s best flavor combinations to ever come into creation. The first person to combine the two should have won a Nobel Prize for their work towards bettering the Earth. 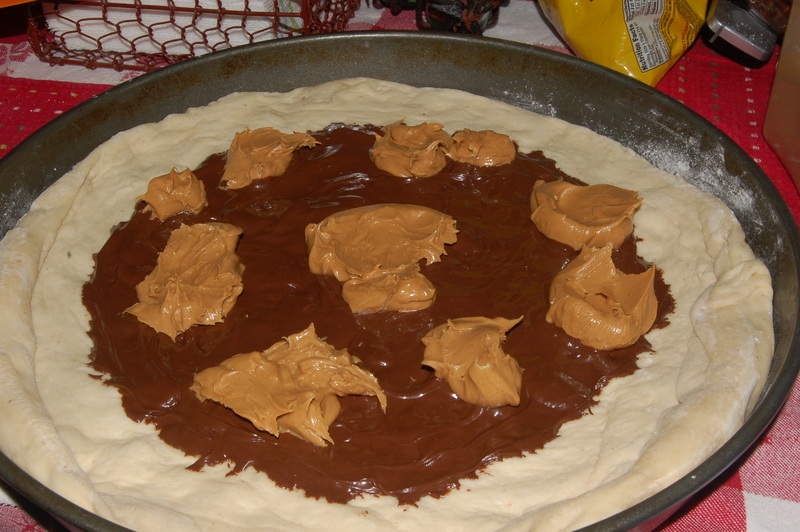 Now, considering that Erik and I both love the peanut butter/chocolate combo and pizza, it’s kind of surprising it took us almost two years of doing Pizza Labs to make a peanut butter cup pizza. Luckily the wait is now over because for February that’s exactly what we decided to do. 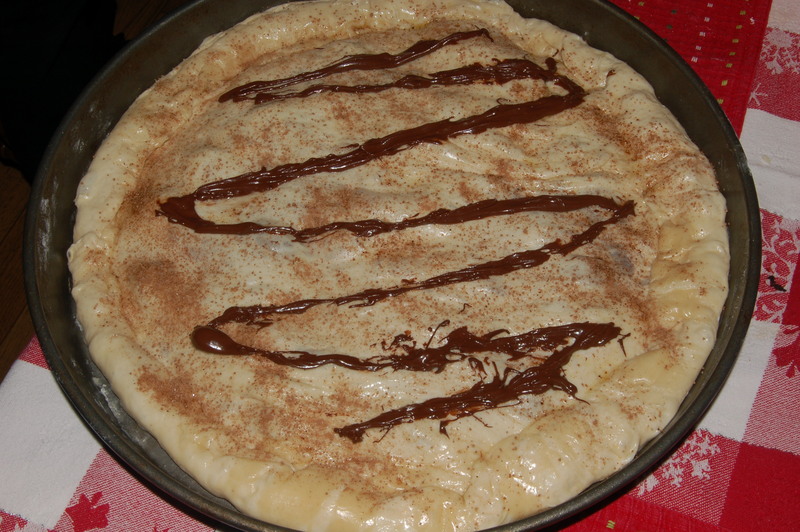 We agreed early on in the month that we should do a dessert pizza in honor of Valentine’s Day. 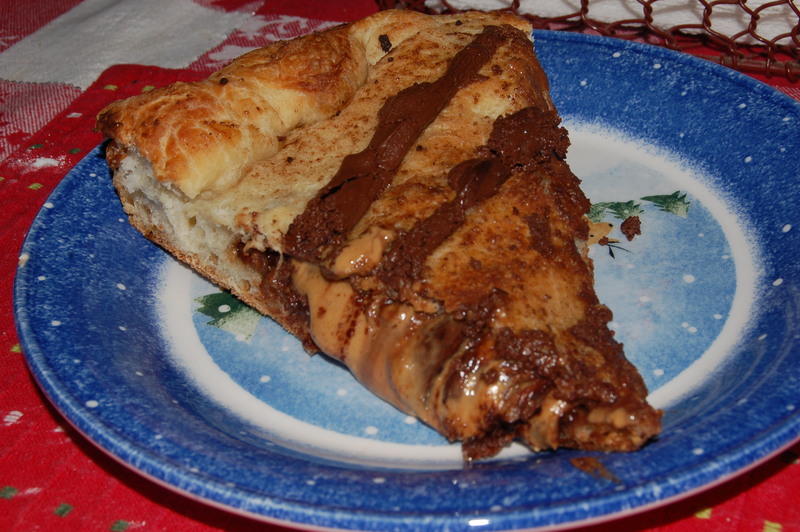 Considering it was one of our newest ideas, we pretty quickly settled on the peanut butter cup pizza. Also it has a lot of chocolate and chocolate and Valentine’s Day goes together. 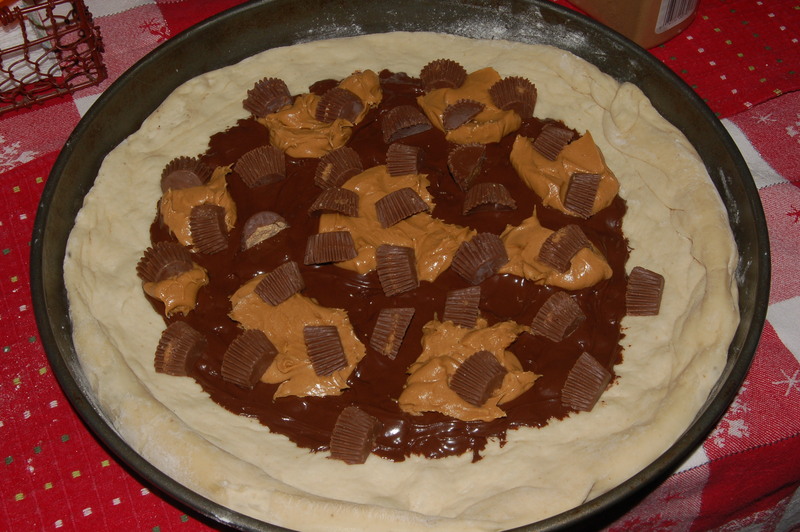 A combination (pizza and peanut butter cups) with a flavor combination (chocolate and peanut butter) that we love in honor of Valentine’s Day. What could be more perfect? 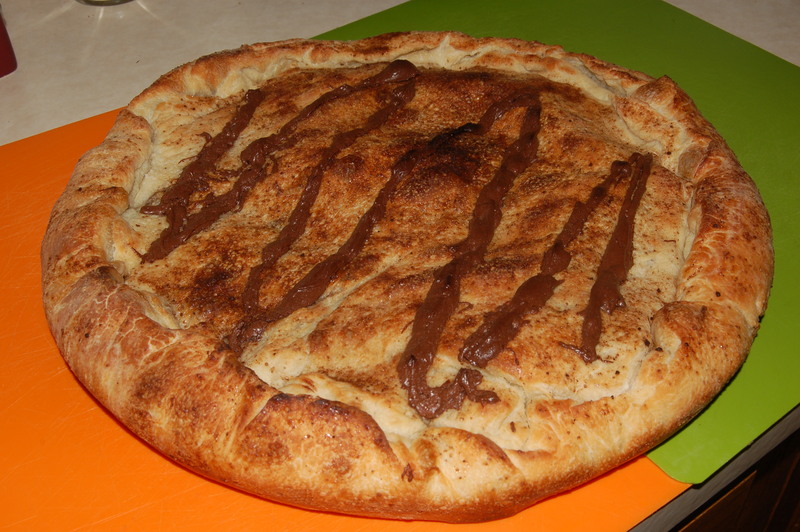 We decided to make this a stuffed pizza to better mimic the peanut butter cup form. If you’re a long-time follower of the blog you’ll realize that this was our first venture into stuffed pizzas. Normally stuffed pizzas are filled with massive amounts of meat, or vegetables. We will definitely be revisiting this pizza format in the future, since it offers a lot of potential. Since this pizza had two crusts, naturally we had to get two balls of pizza dough. We ended up using only half of the second dough ball for the top crust, to make sure that it wasn’t too thick. For the most part the pizza was put together using standard pizza procedure, just at the end it got topped with a second crust. We couldn’t par bake the crust for this pizza like we do with many of our dessert pizzas, since the top crust needed to bake too. 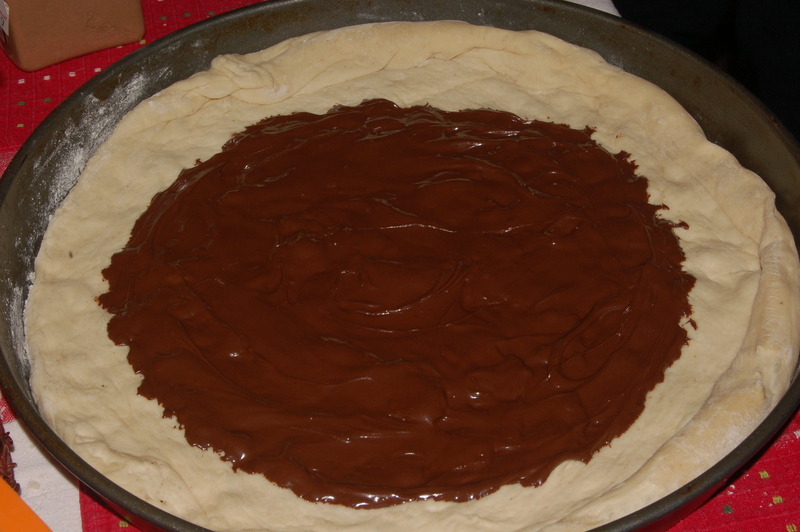 The “sauce” base for this pizza was, obviously, chocolate. We melted some chocolate chips, and once liquidy spread the chocolate on the bottom crust. Next we added blobs of peanut butter. Then sprinkled the whole thing with chopped up peanut butter cups. Probably the most annoying part of this pizza was unwrapping all the peanut butter cups. Then it was time to top it with the second crust. We had to seal up the crusts well to make sure no filling oozed out during baking. Then the top crust got brushed with melted butter, and sprinkled with cocoa sugar. We also drizzled some additional melted chocolate on top. After coming out of the oven, all that was left to do was try it and see how it turned out. So how did it taste? Delicious! The filling tasted almost exactly like a peanut butter cup. The filling was wonderfully gooey. The cocoa sugar on the top crust gave a nice additional chocolate flavor without being overpowering. Something we’ve discovered between this pizza and the s’mores pizza is that chocolate and pizza dough actually go together really well. Overall this pizza was a great success. I suppose the only downside about it is that it is a lot of sweet, so you can’t really eat a lot of it at once. But it’s probably better for our waistlines that way anyway. You got your peanut butter cups in my pizza! You got your pizza in my peanut butter cups! Posted on February 27, 2015, in Pizza Lab and tagged awesome, CHOCOLAAAATE, crazy crossovers, Delicious, dessert, peanut butter, Pizza. Bookmark the permalink. 1 Comment.